[pdf document, U.S. Environmental Protection Agency (EPA). 2002; October, 2001 draft]. This document was prepared by IT Corporation, Las Vegas, Nevada for the EPA's Office of Emergency and Remedial Response. It contains an analysis of the data collected by a range of government agencies of the materials present it the dust cloud that blanketed lower Manhattan after the World Trade Center attacks. The concern was that some of those materials, including asbestos, airborne metals in dust, and particulate matter, had the potential to cause health problems to workers and residents if they were present in sufficiently high concentrations. For this analysis, a database was constructed of the many kinds of data collected by these agencies. The data was then evaluated and sorted by date, concentration, and location to seek trends. Some statistical correlations were calculated. Preliminary conclusions warned that the large number of substances found required prioritization, since few substances had been thoroughly evaluated. Background data from New York City, prior to September 11, would be useful in establishing the impact of the WTC event. Several very high concentrations of many toxic compounds were detected in the bulk dust samples and low correlations between compounds from different classes suggested many different sources of contamination. 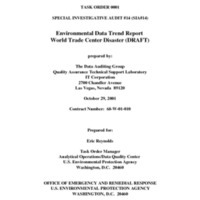 This report was one of the references noted in the EPA-sponsored working group document, "World Trade Center Indoor Air Assessment: "
“Special Investigative Audit #14: Environmental Data Trend Report, World Trade Center Disaster; Final,” September 11 Digital Archive, accessed April 23, 2019, http://911digitalarchive.org/items/show/2895.